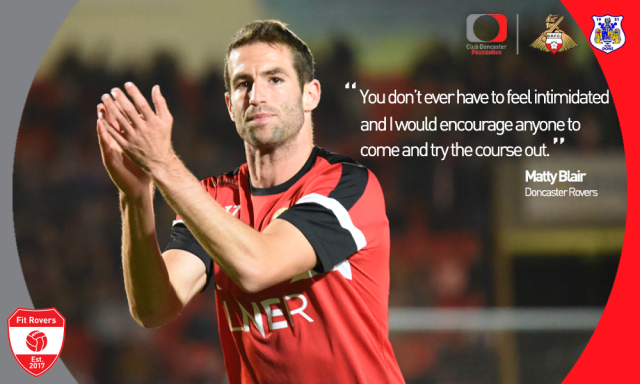 Doncaster Rovers player Matty Blair has sent out a message to all Fit Rovers members pledging his commitment to the programme. The Rovers No.17, who is the current Fit Rovers ambassador, has been so impressed with the programme that he has expressed a desire to carry on coming to the programme when his Fit Rovers role ends in May. When asked if he has any future plans with Fit Rovers during a recent interview with Club Doncaster Foundation, Matty was quick to respond. He said: “I’ll always do Fit Rovers. The winger is a big advocate of the programme and continues to show his support, encouraging people to give it a try. He said: “You don’t ever have to feel intimidated and I would encourage anyone to come and try the course out. “I haven’t met anybody yet that has said he doesn’t like it in the 18 months I’ve been doing it. “Everybody on the programme seems to be happy, seems to be on board and really want to be here. They all want to be a part of something amazing; I don’t blame them. One thing that has caught the eye of the 29-year-old is the impact the programme has on its members, leaving him shocked at the outcomes. He said: “The difference is staggering. “At week one, there were a couple of blokes in there that were probably a little bit shy, timid and unhappy. I came in at week four and they’ve made friends and interacting with everybody whilst also losing weight. “Then at week eight, after speaking to a few of them, they all meet up and do bits together outside of Fit Rovers, which is great to hear. “It’s a friendship bond that you make: they’re losing weight and feeling better about themselves, so long may that continue.